For album number four, the Bristol trip-hop veterans shrink down to a duo, and lose some bliss. It's always a bummer when you anxiously put an ear to one of your favorite bands' new album, only to find that band is but a shell of its former self. Personnel changes have taken place on the sly, the name's the same, but it's just not the same band. You feel like someone's pulled one over on you. 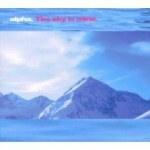 This is definitely the case with The Sky Is Mine, the fourth vocal album from Bristol trip-hop outfit Alpha. Previously a collective consisting of musicians/producers Corin Dingley and Andy Jenks, along with three or four regular vocalists, Alpha has now been whittled down to Dingley and vocalist Wendy Stubbs. In other words, they've become a traditional trip-hop duo, and that's basically what they sound like. Jenks is missing in action, with no clue about his departure or whereabouts given on the band's official website or MySpace page. Stubbs' voice will sound familiar to Alpha fans, as she appears on each of the previous three albums. But while she previously fronted but a few tracks an album, she is squarely in charge of The Sky Is Mine. She sings on all 12 tracks and takes sole writing credit for most of them. Essentially, this is a Wendy Stubbs solo album with Dingley lending a hand. It probably should have been released and marketed that way, too. Had it been a debut, it probably would have been lauded and received more press. It's not a bad album at all. But it just can't meet the standard set by Alpha's other albums, especially 2003's stunning Stargazing. In another bit of sleight of hand, The Sky Is Mine opens with a track called "Stargazing". Is this a leftover from the previous album or a transparent attempt to signify a continuity that doesn't exist? Either way, it's the best thing on the album. Alpha's lush, gauzy, expansive sound has always rested on the border between cozy melancholia and Bacharach-esque melodrama. "Stargazing" gives you that perfectly blissful comedown feeling, with its comforting electric piano figure leading up to a reverb-laden chorus that justifies the song's title. It's everything good about Alpha, and its an encouraging sign that Stubbs and Dingley haven't lost the plot. Of course, by the time The Sky Is Mine winds to an end eleven tracks later, they're hanging onto the plot by a very thin, frayed thread. In between, though, are several worthwhile songs. "Brood" does just that, creeping in on an insinuating bassline and making good use of sweeping strings and, to top it off, a droning tamboura. "Burn Me Again" is all sparse, tense piano right up until the end. Then, it bursts into a demented, ascending crescendo a la "I Am the Walrus", complete with Dingley's pummeling, dead-on Ringo Starr fills. It's a truly thrilling moment on an album that doesn't have enough of them. By the penultimate "Silver Bullet", the quiet/loud technique has become overused and a couple other problems have become evident. First, while Stubbs is a capable vocalist and lyricist, she simply doesn't possess enough heft or character to carry an entire album. Her shrewd, elfin delivery is equal parts Beth Gibbons of Portishead fame and Siouxsie Sioux, but without the particular power of either. She seems to be holding back much of the time, and when she does finally let go on the crushing, heartbroken "For the Wages", she can really belt. All of Stubbs' songs, though, focus on the delicate nature of relationships. The theme certainly fits the slow, grandiose music, but it also eventually wears thin. This is where, on past Alpha albums, a vocalist like Kelvin Swaybe or the inimitable Martin Barnard would create real sensitivity, not to mention variety. Here, they're sorely missed. The stripped-down lineup means that The Sky Is Mine is actually Alpha's most direct album to date. "May" almost qualifies as a pop song. But hooks and melodies were never Alpha's strong suit, and they didn't need to be. Though it's perfectly commendable, The Sky Is Mine can't help but be a disappointment. Not even the bonus selection of undistinguished instrumentals and remixes on this two-disc version can detract from that impression. Ironically, by going from a loose collective to a solid duo, Alpha has become less defined, and less definitive.